I used American Apparel Cotton as a base, with American Apparel Hassid for the black, American Apparel Manila for the yellow, China Glaze Salsa for the red, CND Green Scene for the green, and Pure Ice French Kiss for the blue. Topped everything off with 2 coats of Seche Vite top coat. And, for my eye makeup today, I used MAC Chartru paint as a base, with MAC Jasmine on top, Lucky Green in the crease and bottom lashline, Velvet Moss in the outer corners, and MAC Orange pigment in the inner corners and waterline, then I used New Weed fluidline as a liner. thank you from a proud south african! are still very proud of Bafana Bafana!! Awesome and peaceful all at the same time! heyyy! since you did such FABULOUS FIFA-nails, can you also do NBA Championship Finals nails? The last game is tomorrow (or today? lol), Thursday June 17. One hand could be LA Lakers and the other hand Boston Celtics, with the thumb being a basketball. Just a suggestion! But Id superloveyou even more if you did! awsome I have to admit I have been waiting for you to do World cup nails. Totally worth the wait. Cool! The thumb is perfect! Nice topic in a useful blog ) & that's my blog it's about Best Mobile Phones Previews, Latest Mobiles, Mobile News and more. I hope you visit me soon . LOVE!! What a great idea for the "accent" nail. Those are fantastic and fun! Great job! 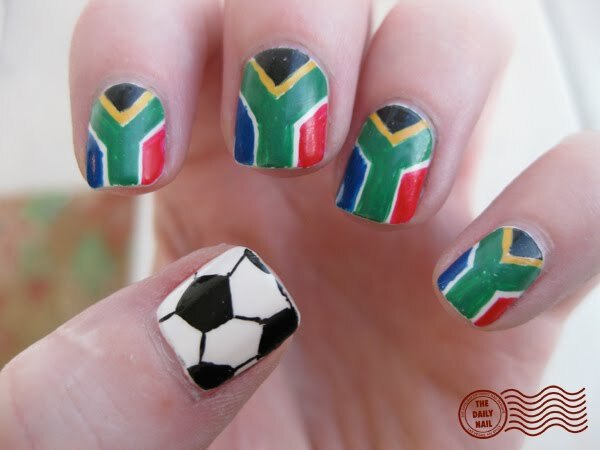 I did some Netherlands nails, the flag is much simpler than South Africa's!!! I did the flag on the thumbs and the fingers were neon orange. I wore it for three days and wouldn't take them off until a stranger said something...finally the drive thru at Taco Bell mentioned them! From your fan in Huntsville AL. The thumb with the football looks awesome! Great nails! A right brilliant idea on keeping the peace, too. And your eye makeup is again, beautiful- but seriously- how long are your eyelashes?! They are at least a mile, yeah? Is that natural, or are you assisted by some fabulous mascara that we need to know about? Hey I just started a blog and would love some comments/suggestions. Heey, take a look in my flickr!? Very Pleased with these ones, I am from SA and the 16th was our Youth Day ,so you could not have picked a better day than that to honour us. As we would say in SA Your nails are totally Ayoba- our way of saying, amazzing,Fab ,Awesome and everything else that's really great!!!! Você é minha musa ispiradora! Adoro ver os seus desenhos,adoro seu trabalho! Deus te abençõe! beijos!